It feels a little bit like a love story with a tragic ending everyone already knows. 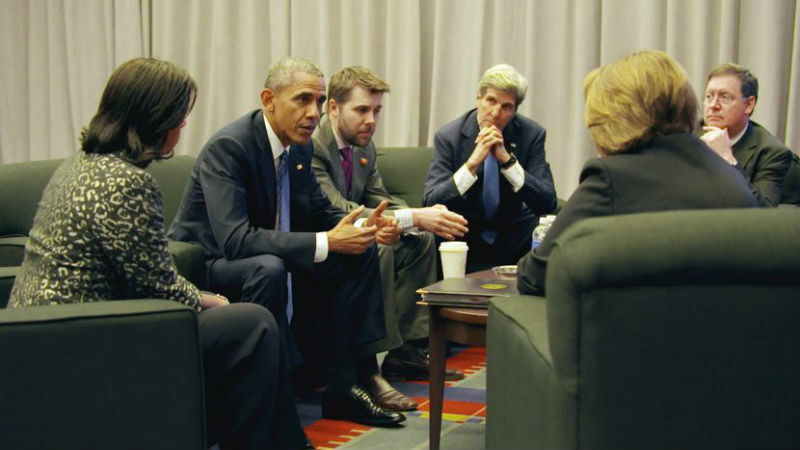 Obama is kind, eloquent and extremely likable, as so are his three associates composing the tripod for this film: US Ambassador at the UN Samantha Power, Deputy Security Advisor Ben Rhodes and Secretary of State John Kerry (pictured together below). Everyone is avuncular and magnanimous. 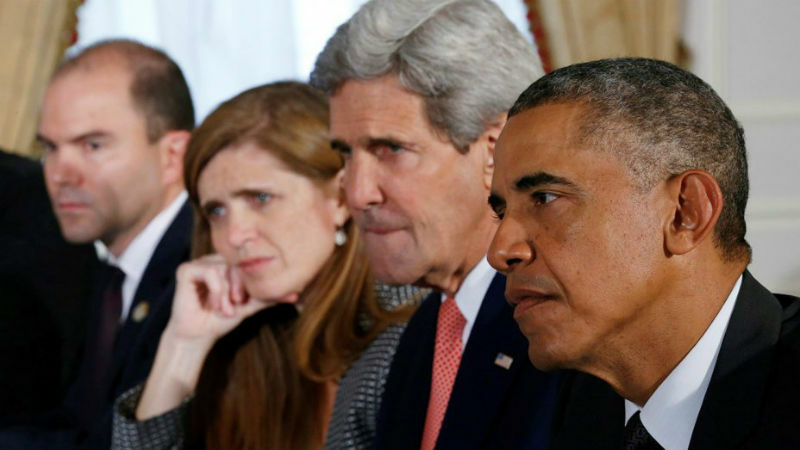 It’s simply delicious to love these adorable people in their final year in office, particularly when you know that a grotesque narcissist is about to succeed Obama in office, and wreak havoc to just about everything that has been achieved in as little time as possible. It’s very refreshing to see that until recently the people running the corridors of the White House were more liberal and humane. Samantha cries as she talks about being welcomed as an immigrant to the US (she was born in Ireland), as she encourages more people to come to their country. Meanwhile, Obama travels to Hiroshima and talks about “our shared responsibility to look in the eyes of history”, urging people to make no more wars and also to reflect where it all went wrong. This is in stark contract to Trump’s constant ultra-xenophobic rants (such as the “shithole countries” remark) and unabashed belligerence (such as comments about the size of his nuclear button). A lot of action is quite informal, and sometimes it feels like you’re inside someone’s (very posh) house, instead of the residence and workplace of the president of the US. Ultimately, this is a very romantic and idyllic representation of Obama and his associates, yet not vulgar and jingoist. As everyone already knows, Obama is extremely inspirational and eloquent, and his rhetoric has remarkably conciliatory tones. He’s indeed the bloke would like to have a beer with at the pub. Kerry and Rhodes are a little more stern, but still affable enough. Power is the epitome of altruism: she travels to Nigeria to in order how much the US cares about Boko Haram kidnap victims (reminded me a little bit of Ed Sheeran, except she’s not an artist). In a nutshell, this is a warm and fun film to watch, but also a piece of US propaganda. It showcases the relatable and and human side of US government to both American voters and the world. The message is: “look, the US used to have a heart, a friendly face”. This heart has since been replaced with a d**k, and the friendly face with an ugly expression of arrogance and indifference. Not to mention a silly finger ready to enter uninvited orifices and press nuclear button at its convenience. The film doesn’t go into the details of Trump’s administration, but we all know what’s happening. Rhodes fears that the new president will destroy what was achieved for the environment, Cuba and Iran. He’s already ruined Cuba and the environment in less than year, and Iran is not far down the list. The problem with The Final Year is that it lacks any balance whatsoever. While this is indeed a wonderful time to be nostalgic of the Obama administration, let’s not forget its shortcomings. In his final year, Obama dropped 26,171 bombs across the world (three every hour). Plus he never closed Guantanamo Bay, contradicting his very own commitment in his first day in office. His administration tacitly consented to three coup d’états in Latin America (in Honduras, Paraguay and Brazil; all under the same US Ambassador Liliane Ayalde), while the region mostly experienced stability under Bush. The film doesn’t even touch on any of that, choosing to focus on Syria and the usual Russophobia prevalent in the US. The EU and the UK are almost entirely absent in the movie (Boris Johnson is quickly to be seen, but not to be heard in the film). No mention of Assange, either. The film closes with Obama final trip as president. He visits Greece, the birth of democracy. The mood feels a little funereal, as Trump has already been elected and we all know what coming next. Obama remains balanced and positive, and his message is concise and pertinent as usual. “History doesn’t follow a straight line”, he claims. He also talks about great world powers no longer fighting world wars, and points out that conflicts in the 21st century pale in comparison to the 20th century, and urges us all to sustain this. All extremely well said. If only his actions matched his words. The Final Year is out in the best cinemas across the UK on Friday, January 19th.